Reference the previous post, perhaps it was too easy, but of course that was James in the Ascona (with Ian Grindrod) while Andrew (with Derek Taylor) was in the Team Ralliart Colt Lancer Mitsubishi Lancer 2000 Turbo, but put it off on SS51. 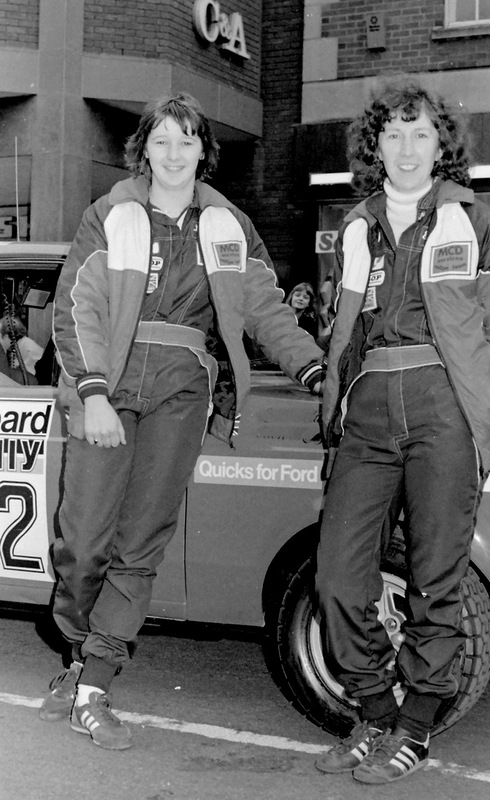 They were indeed pictured before the start of the 1800 mile 1981 RAC Rally based in Chester which had 464 miles of stages in the 65 stage route. Aye, them were't'days. As promised here is the other pic I came across from the same event - she finished top Scot in a remarkable 19th place overall in an RS2000. To put that in perspective, Roger Clark was 10th in his works Mk2 while top Brit was Terry Kaby, 7th in a Toyota Celica. I had to think hard about posting this one. The likelihood after she sees this is that there will be no more cake for me at the next rally service. And guess what? I've got another pic. If anyone gets this one right, I'll allow you to buy me a beer at the Solway Coast post-rally bevvy on the Saturday night.